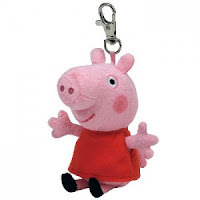 Get FREE Peppa Pig Backpack Clip. Just “Like” Official Peppa Pig US page on Facebook and fill out the form. Supplies are limited. Peppa is a loveable, exuberant little piggy who lives with her little brother George, Mommy Pig and Daddy Pig. Peppa’s favorite things include playing games, dressing up, days out and jumping in muddy puddles. Her adventures always end happily with loud snorts of laughter.